One of the Huskers’ biggest issues right now, as offensive coordinator Danny Langsdorf sees it, is on third down. After a 2-for-14 showing against Oregon a week before, the Huskers converted just 6-of-19 on third down against Northern Illinois on Saturday, including 4-of-10 from inside 4 yards. From there, Langsdorf said it’s easy to diagnose the other issues plaguing the Husker offense. He said they’re having too many three-and-outs and struggling to maintain drives. Asked what’s causing those driving issues, Langsdorf pointed to a mixture of things. For three weeks now, though, Langsdorf has gone back to the protection issues up front. He sees that as the center from which all of the other problems come from. It’s not just on the five linemen though. When Langsdorf talks about the “unit,” he’s also talking about tight ends and running backs doing their jobs too. “Sometimes it’s a one-on-one matchup that we’ve lost, sometimes it’s been not the correct help or not a good enough help by the adjacent linemen or a tight end or a back,” he said. The inconsistencies up front have also been something Langsdorf thinks have contributed to the struggles of quarterback Tanner Lee, not just against Northern Illinois, but all season. Langsdorf even said they had to stray from what they wanted to do offensively at times to try and make up for the blocking issues. Langsdorf said the offensive line is a prideful group, and they’ve taken their struggles personally. He said he’s been pleased with how the team as a whole has regrouped after watching film from Saturday and has turned their sights to the upcoming game against Rutgers. >> With starting right tackle David Knevel still rehabbing a right foot sprain and his replacement, redshirt freshman Matt Farniok, getting a pin inserted into a broken wrist, Langsdorf said the Huskers are looking at true freshman Brenden Jaimes and sophomore Christian Gaylord. Nothing has been decided yet, and Langsdorf said it’s “50-50” right now between who would get the nod, but added that decision wouldn’t come until later in the week. >> Keyan Williams, a Fresno State transfer at wide receiver who has yet to play this season due to a hamstring injury, appears close to a return. "I think this week will be the week," receivers coach Keith Williams said. "We'll see tomorrow." Keith joked that Keyan's recurring hamstring problems might be inherited because his hamstrings are like "guitar strings." >> Running backs coach Reggie Davis was pleased with how tailback Mikale Wilbon performed in his first career start against the Huskies. “A game like that it’s hard to find a whole lot of good but there were some times he was able to squirt loose and some times he got us out of some bad situations,” Davis said. Wilbon, who finished with 90 yards on 24 carries, could be in line for another start against Rutgers with starter Tre Bryant still being listed as questionable. Bryant did not practice Monday. >> Northern Illinois cornerback Shawun Lurry said something just told him to jump a Nebraska bubble screen on the Huskers’ first drive Saturday. The result was an interception returned 87 yards for a touchdown, but Langsdorf said Lurry just gambled. 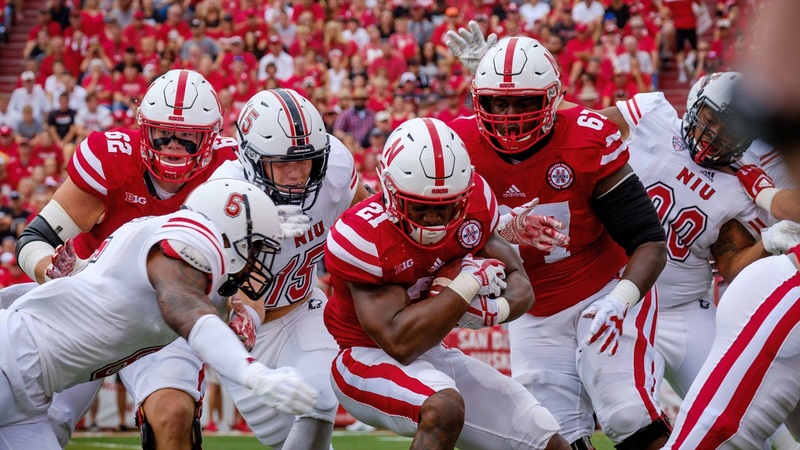 Langsdorf said they just need to do a better job of reading situations like that – Lurry was creeping off his man on the outside preparing to knife to the football before the snap – and run the ball or check to something different.